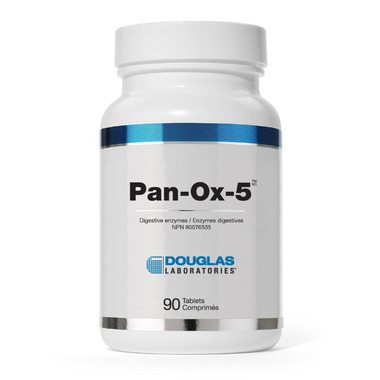 Pan-Ox-5™ is a comprehensive dietary enzyme supplement that is specially formulated for digestive support for the gastrointestinal system. The pancreas supplies the major digestive enzymes that catalyze the breakdown of carbohydrates, proteins and fats, so that the breakdown products may be properly absorbed in the upper small intestine. This unique blend of enzymes provides additional support to pancreatic enzymes to further digestion. It offers amylase, the major carbohydrate-digesting enzyme; lipase, the primary triglyceride-digesting enzyme; and pepsin and protease to help break down proteins. Also included is bile, which is normally secreted from the gallbladder to help aid in the digestion of lipids in the small intestine. Ingredients such as diastase can also aid in the digestion and absorption of food. In addition, betaine, glutamic acid and papain are plant-based enzymes commonly found in vegetables, grains and papaya, respectively. Beta vulgaris is a natural source of betaine and also provides antioxidants.